Bob & Terry Lee, founders of Oregon Motorcoach Center, are pleased to welcome Matt Carr (owner of Carr Industries) as General Manager. Matt Carr was plant manager in the former Country Coach Inc.’s cabinet shop in Junction City, Oregon. In that position he was instrumental in the build/design process of all cabinetry for every Country Coach floorplan and model built during his tenure with the former manufacturer of Country Coach brand luxury motorcoaches. After 23 years at Country Coach Inc., he launched Carr Industries (www.carr-industries.com) with his wife Elaina, specializing in hand crafted cabinetry, countertops, window treatments and other services for the RV industry and residential/commercial spaces. These services are still available as Oregon Motorcoach Center and Carr Industries remain two separate family operations now under one roof. Matt Carr and the entire OMC team look forward to your next visit to Oregon Motorcoach Center, located convenient to I-5 and adjacent to Eugene’s Mahlon Sweet Airport at 29417 Airport Road at Eugene, OR 97402. Telephone: 800-942-6860 or 541-762-1505. 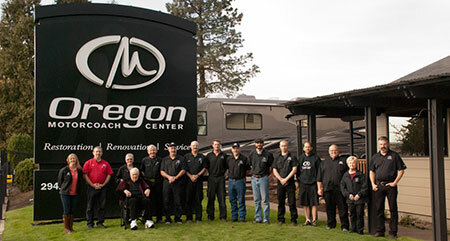 Website: www.oregonmotorcoachcenter.com. Media Release prepared by Sherry Fanning. Questions regarding this release may be directed to Matt Carr or Terry Lee at 541-762-1505.